Just hoppin’ on the blog quickly today to let everyone know about this fantastic little place called Change Islands tucked away in Newfoundland (my mother and husband are from there). 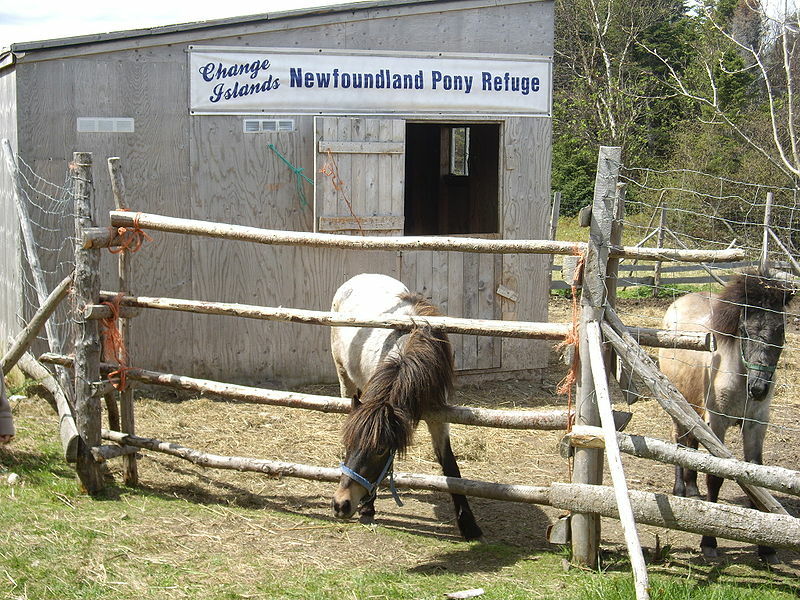 The island is a beautiful spot full of history and wonderful people…and the Change Islands Newfoundland Pony Sanctuary. And right now, you can vote (quick registration required) for the Pony Sanctuary in the Aviva Community Fund to help them get funding for a new barn to house the ponies and continue the work that they have been doing to maintain the Newfoundland pony population and revitalize the community of Change Islands, Newfoundland. Did you know that Elizabeth Taylor owned a Newfoundland pony as a young girl? And that the Governor General of Canada visited the ponies and his wife named one of the ponies “Kate” after the Duchess of Cambridge? “Kate” still lives at the Sanctuary. 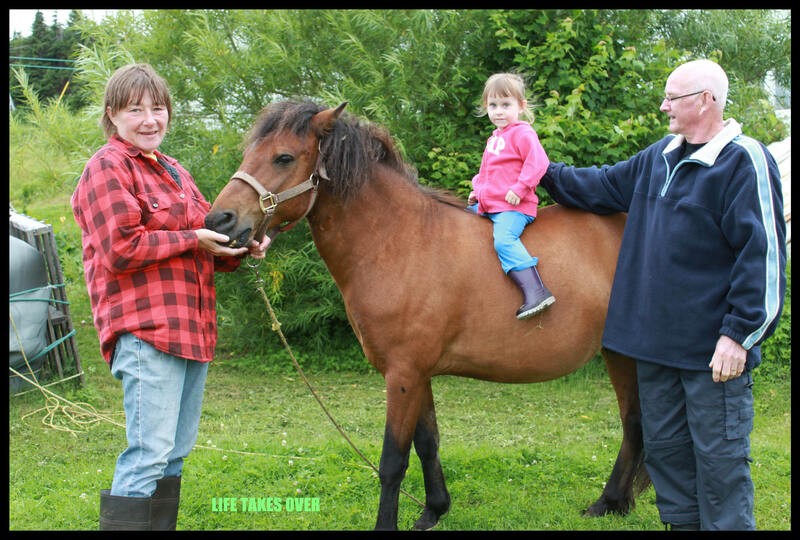 The woman who runs the sanctuary and cares for the ponies is my husband’s aunt (shown below with my daughter). VOTE FOR THE CHANGE ISLANDS NEWFOUNDLAND PONY SANCTUARY! 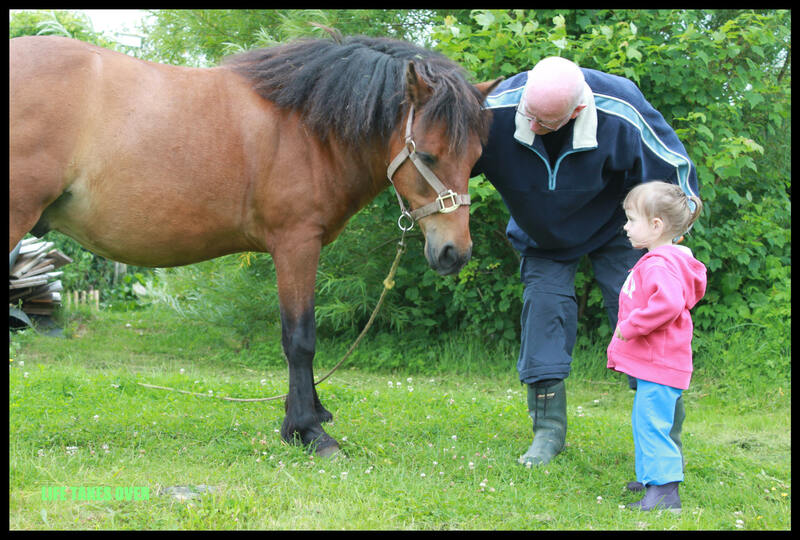 That’s my daughter when she was two with her grandfather and her great aunt (the lady who cares for the ponies). The Changes Islands Newfoundland Pony Sanctuary has made it to the Aviva Community Fund Semi-Finals. Please VOTE and help them win! Big Sister getting to know a Newfoundland Pony with her Poppy on Change Islands. If you ever have a chance to visit Newfoundland, a visit to the ponies on Change Islands is something you won’t want to miss! This entry was posted in Uncategorized and tagged animals, Aviva Community Fund, Blogging, breeding program, Changes Islands Newfoundland Pony Sanctuary, community, family, Family, horses, Kids, nature, Newfoundland ponies, outdoors, travel, Travel on December 2, 2013 by Nancy.